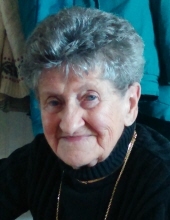 Shirley Mae Davies, age 96, of Huron Beach died at Nash Manor on Tuesday April 9, 2019. Born in Detroit on December 2, 1922, Shirley was the only child of Milton and Mae Fleck. She married Basil Davies in Detroit in the early 1940’s and they spent their honeymoon at Black Lake. Little did Shirley know that she would eventually own a cottage on Black Lake where she would spend weekends and summer vacations for years to come. She loved Northern Michigan and made many friends in the Onaway area. She eventually bought a permanent home and moved to Huron Beach in 1998. Shirley was a homemaker as well as working at Vic Tanny Health Club as an exercise instructor. Quite athletic and a bit of a daredevil, being physically fit was very important to Shirley. She enjoyed exercise, waterskiing, and snowmobiling. She even rode on the back of her son’s motorcycle when she was well into her 70’s. She didn’t mind driving fast and was known to take snowmobile jumps with her son and his friends. Though she had an adventurous spirit she also had a tranquil and quiet side. A nature and animal lover, Shirley loved watching deer and other wildlife and adored her dogs. She enjoyed going for peaceful rides through the woods, taking long walks along the beach, knitting and crocheting. Fashionable and stylish, Shirley always had great taste; she enjoyed dressing nicely and looking her best even if she was just going to the grocery store. Shirley will be remembered as a fantastic mother who had a great sense of humor and a wonderful zest for life. Surviving Shirley is her son, Daniel Davies of Huron Beach; niece, Rachel Heuser of Brighton; and lifelong friend, Janet Stranaly of Onaway. Shirley was preceded in death by her husband in 1986. It was Shirley's wish that there be no funeral or service following her death. Those planning an expression of sympathy please consider a donation in memory of Shirley to Cheboygan County Humane Society, 1536 Hackleburg Rd., Cheboygan, MI 49721. To plant a tree in memory of Shirley M. Davies, please visit our Tribute Store. "Email Address" would like to share the life celebration of Shirley M. Davies. Click on the "link" to go to share a favorite memory or leave a condolence message for the family.